The substrate is among the most important features in your crab's tank. He'll play in it, eat it, burrow in it and use it for molting. Several types of sand are suitable for hermit crabs; you just have to know which features the crabs prefer. Cleanliness, texture and the ability to hold moisture are all pivotal in choosing the right sand. A variety of sands sold in venues other than pet stores are suitable for a "crabitat" as long as they are clean. Clean sand often is sterilized and always free of mold, bad odors and pest infestations. 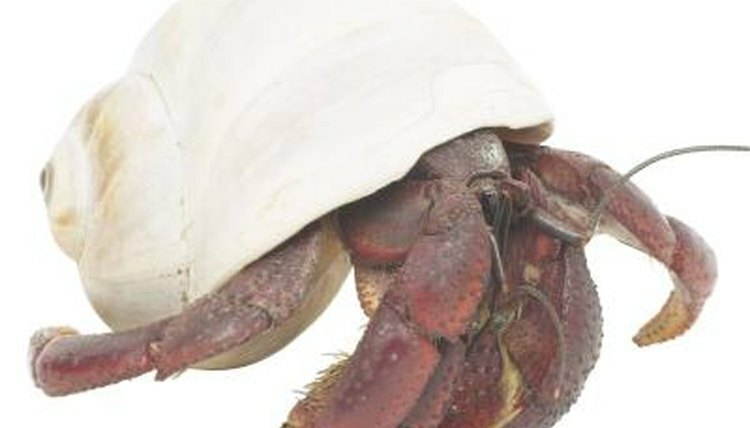 Pet supply stores sell specialty sand for use in hermit crab enclosures. All-purpose sand is an inexpensive alternative to many of the specialty sands found in pet supply stores. When looking for a clean sand, inspect the package for holes where water and insects could get in. Also look for a sand labelled as "clean" or "sterilized." While you may believe that all sand is created equal, it's not. Sand comes in a variety of textures, which could benefit or potentially harm your crabs. The sand should be fairly coarse so it packs well and holds moisture. The sand isn't simply a substrate that the crabs walk on; they dig and burrow in it, play with it and sometimes even eat it. A super-fine sand packs too well, making it difficult to dig in for the crabs. If you're unsure of the coarseness, run the sand through your fingers before putting it in your crab's tank and moisten a small amount of it. Test it out and see how easily you can "burrow" in it by using your fingers. It should be reminiscent of the ideal sand for building a sandcastle. When crabs molt, they'll build a shelter out of the sand. The sand should pack well enough to hold in a cave-like formation. Pre-mixed crab substrates are available at pet supply stores and online retailers. Different mixtures create different textures. Special terrarium sands are also widely available, although the texture varies. Beach sand is OK for many crabs as long as it's not too fine. Clean, all-purpose sand sold at hardware stores often is ideal; clean play sand is sometimes too fine for the purpose of a crabitat. When you put the sand in the tank, a common mistake is not making it deep enough. The sand should be deep enough for the crab to completely bury himself in it with a little to spare. The sand also plays a part in the humidity of the tank. Moistening the sand can keep the humidity up. As a crab owner, you'll have to moisten the sand on a regular basis to keep it moist enough to pack.